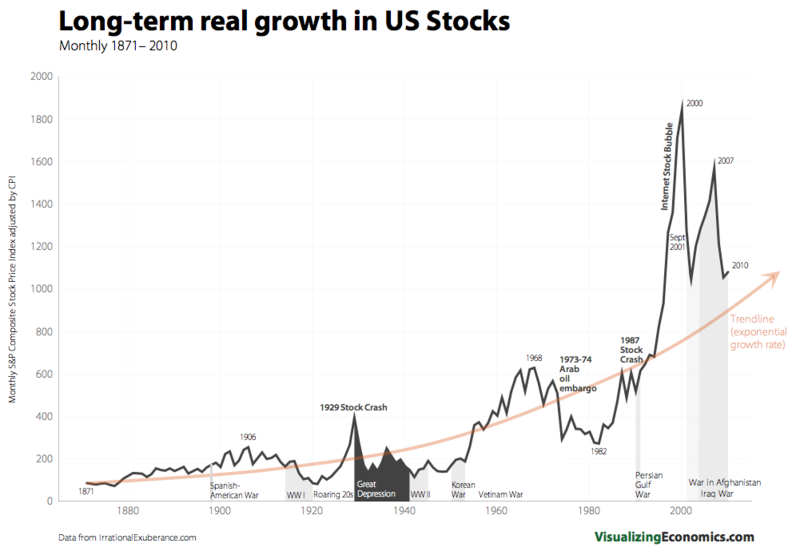 Have a look at a graph of US stocks real growth over the period 1871-2010. This graph was adjusted for inflation and does not include reinvested dividends. 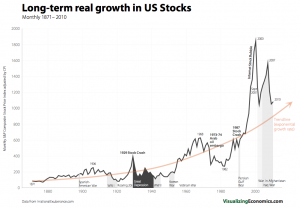 As you can see, stocks as opposed to commodities or foreign exchange tend to have a long term upward trend that you should not ignore. 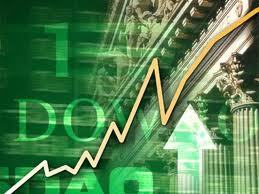 Investing into stocks is more or less investing into the country as such. As long as the country is democratic, free, the companies prosper and GDP thus grows, the stocks will rise over the long term as well. I am not sure if this holds for commodities or forex. Rather not. Martin Kollár pridal tento článok v kategórii Passive investing	on Monday, November 1st, 2010 at 10:17. Komentáre k tomuto článku môžete sledovať cez RSS. Môžete pridať komentár alebo trackback z Vašej stránky.